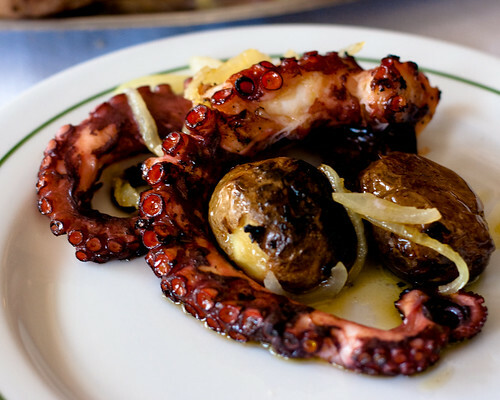 Welcome to Catavino’s Gourmet Guide to Lisbon! This guide covers everything you need when traveling through Lisbon, including the bites and the sites! If, however, you’re looking for a guided experience, check out our Lisbon food and wine tours or let us design a customized tour for you! In the last few years, Lisbon has been reinventing its classic Portuguese cuisine with a new, refined flair. While there are still plenty of old-fashioned mom and pop tascas and tabernas serving the classics, several new high-end gourmet-style versions have been opening in the downtown and other affluent neighborhoods. Because the Portuguese will never part from their beloved favorite foods and dishes, many new restaurants are incorporating rustic vintage styles with contemporary hipness – both in decor and cuisine. Often this means replacing the cute little mamas behind the stove with young, innovative chefs who take simple comfort foods and add a twist or perhaps a more “exotic” flair. The same makeover has occurred with the concept of petiscos – the Portuguese version of tapas – and many of the new menus are designed with this “pick and choose” concept in mind. Additionally, the traditional hole-in-the-wall bakeries, open only in the mornings, are taking a back-seat to brightly lit French patisserie-style influenced padarias. These padarias are open all day and produce high-end versions of classic Portuguese breads and pastries, with spacious seating areas to enjoy them with a refined Portuguese coffee. Although wines-by-the-glass have been struggling to gain in popularity among restaurants and bars, many more wine-bars have been opening up and catering well to the still niche market. Gourmet stores are also popping up in downtown Lisbon, reigniting the tradition of Portuguese canned fish, sweet jams, and preserved fruits by repackaging them in colorful, artistic new containers and selling them at higher prices. Ethnic restaurants from former colonies have become more popular in recent years, especially Brazilian, Goan and African cuisines. Sushi has become the “in-fashion” food of the moment, with many new highly-acclaimed Japanese restaurants applying fusion with local Portuguese fish and ingredients. Lisboners, like all from Portugal, are very proud of their cuisine – claiming that it’s the best in the world. I must say they’re not too far from the truth! This is probably why they have such a love of food and drink in their everyday lives. All holidays and social gatherings in Lisbon seem to revolve around a good meal with wine at a restaurant or an ice-cold imperial or a strong bica at a bar or café/pastry shop. If we haven’t convinced you enough, here are 10 delicious reasons to savor Portugal, along with 20 must try Portuguese dishes. If you’re craving tips to guide you expertly through the country, check out our Essential Guide to Traveling Portugal! When it comes to satisfying their serious coffee fix, many working Lisboners will have up to 5 bicas (Lisboner for espresso) a day, throughout the week, while magically managing to sleep at night. This coffee addiction, as well as an enormous sweet tooth from a long history of pastry-making, have contributed to an abundance of cafés and pastry shops all over the city. You can still find a simple Portuguese espresso for as little as €0.60 and a quick Portuguese style breakfast of fresh bread (pão de leite – “milk bread” similiar to a butter roll is a common breakfast bread) with ham or cheese, fresh squeezed orange juice and hot milk, along with your coffee, for as little as €5.00, making cafés one of the few businesses that can survive in any economic condition. Most cafés/pastelarias are open as early as 7:00 am and close around 7 or 8 pm. Normally only the tiny cafés frequented by mostly men alternate as bars in the evening. The most popular style of bars in Lisbon are the casual street bars, where everyone can gather outside with their drinks in the small streets and alleyways. Most of these bars don’t open until late afternoon with the majority of business starting after the dinner hour. The drink of choice is usually beer as it’s the cheapest, with Sagres being the most recognized brand in Lisbon. Other popular drinks include the Portuguese liquors – Licor Beirão (similar to Drambuie) and Amarguinha (a light and sweet almond flavor), both usually served on the rocks with lemon, and the Brazilian import Caipirinha, which several variations of it have been mixed up here including Caipirão (with Licor Beirão), Caipiroska (with vodka), Caipinegra (with “black”berry vodka), and my favorite – Morangoska (Caipiroska crushed with fresh strawberries). Wine is almost never drunk at regular street bars and lounges but there are now several great wine bars all over the downtown to indulge in a glass or two of high-quality vinho from any of the Portuguese wine regions, along with the opportunity to try queijo (cheese) and enchidos (cured meats and sausage) as well. Nightclubs, called discos, are popular among certain crowds but be prepared for long lines and hefty cover charges. Bairro Alto – Going uphill from Largo Camões where the #28 trolley passes, this area is the most famous for nightlife. There are also plenty of nice Fado bars, wine bars, lounges and restaurants. Chiado – Down from Largo Camões, starting at the upper Baixa Chiado metro entrance, is a area known for great high-end shops, restaurants and cafés, including the famous Café a Brasileira next to the statue of Fernando Pessoa. Bica – Across the main street from Bairro Alto is the Bica Elevator track, lined with refined street bars that generally cater to an older crowd (30+), making the ambiance a little less intense than Bairro Alto. Rua Nova do Carvalho – Down the hill from Bairro Alto, close to Cais do Sodré, is the newest “hot spot” for outdoor bars, many boasting of upper balconies that overlook the the vast Lisbon skyline. Santos – Further out from Cais do Sodré, across the main avenue from the Santos train station, is the “Design District” decked out with stylish lofts. Come here if you’re keen for a more elegant evening in a chic lounge or upscale restaurant. During the week, most Lisboners head out to an inexpensive home-style lunch at one of the numerous casual dining locales. Classic Portuguese restaurants, and most café/pastry shops, will post the Pratos do Dia (Plates of the Day) consisting of a: sopa (soup), peixe (fish dishes) and carne (meat dishes). Offerings change daily. The sopa do dia is usually a puree of vegetables which people either like to have for something quick or add it the the beginning of their meal. It’s normally acceptable for workers (more men than women) to have a beer or a small carafe of wine at lunch. A tip to find an authentic local restaurant is to spot that handwritten Portuguese menu on a window- instead of a generic plastic menu with faded photos. Additionally, check for wood furniture – usually a good sign of authenticity. Come evening, expect a meat or rich bacalhau dish with wine. Restaurants will usually sell wine by the bottle or jarro (the carafe). It is also common to indulge in a little digestivo at the end of the meal, such as a whisky, Portuguese brandy (like Macieira), Moscatel or aguardente. Pasteis de Belém – Lisboners will argue that you cannot visit the city without trying these famous custard tarts – despite lines out the door and apparent chaos in Lisbon’s most famous pastry shop in the touristy riverfront area of Belém. The best time to go is during the week (Tuesday or Wednesday) in the low/offseason and don’t be discouraged if you see a line out the door of the shop – that’s the takeout line. Make your way back through the jumbled connection of mini-dining rooms until you come to the very last room, which is the largest and the line (if any) is the one you want to wait in because it goes much quicker! Make sure you’re ready to order when your waiter comes; it’s easy because they only sell Pasteis de Belém and drinks – order at least 2 per person. The best drinks are Portuguese coffee and/or Port wine. A Ginjinha – Though the drink originally comes from the nearby town of Óbidos, A Ginginha’s tiny hole of a “bar” nestled between the Rossio and Figueira plazas in the downtown is by far the most popular place outside of Óbidos to have this sweet Ginja cherry liquor. Torrada – Portuguese toast is made from a specific Portuguese bread sliced thick and slathered in butter. Savor it with a Galão, a smooth Portuguese coffee with a healthy serving of milk in a tall glass, a great start or end to your day. Tip: Grab the middle strip of bread which is the softest and most buttery! Bacalhau, any kind! – You cannot come to Portugal and not try one of their 1,001 preparations of bacalhau, the staple of Portuguese cuisine. Everyone has their own preference of saltcod dish, but some of the more popular ones in Lisbon are bacalhau á bras (fried with potatoes and onions), bacalhau com natas (au gratin style), bacalhau á Gomes Sá (baked with potatoes, onions, boiled egg and olives) and pasteis or pataniscas de bacalhau (two styles of saltcod fritters). Peixe Grelhado – A simple yet perfectly grilled Portuguese fish. Though you can find this anywhere along the Portuguese coast, Lisbon is the coastal capital and a great opportunity to start there with fish at any one of the local restaurants. 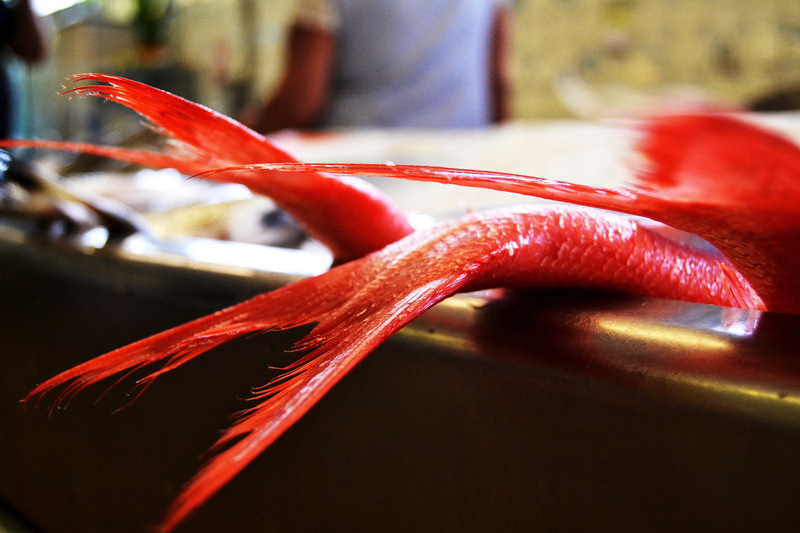 Try a common light fish like dourada (gilt-head bream) or robalo (seabass). Bitoque – This may look like a simple thin piece of steak with a fried egg on top, but when done well, it’s an ode to perfection layered in a delicious sauce and accompanied by typical Portuguese homestyle fries, rice and salad. Bifana or Prego – Though not originally from Lisbon, these pork sandwiches and steak sandwiches are the quintessential Portuguese street food and one of the city’s favorites for a quick bite. You can try one at most small cafés and have a gourmet version of it at many of the new trendy Portuguese petisco-style restaurants. Vinho de Lisboa- It would make sense if you’re in Lisbon that you should try the regional wine. If it’s white, try one from the subregion of Bucelas, and if it’s red, you can’t go wrong with one from Colares. 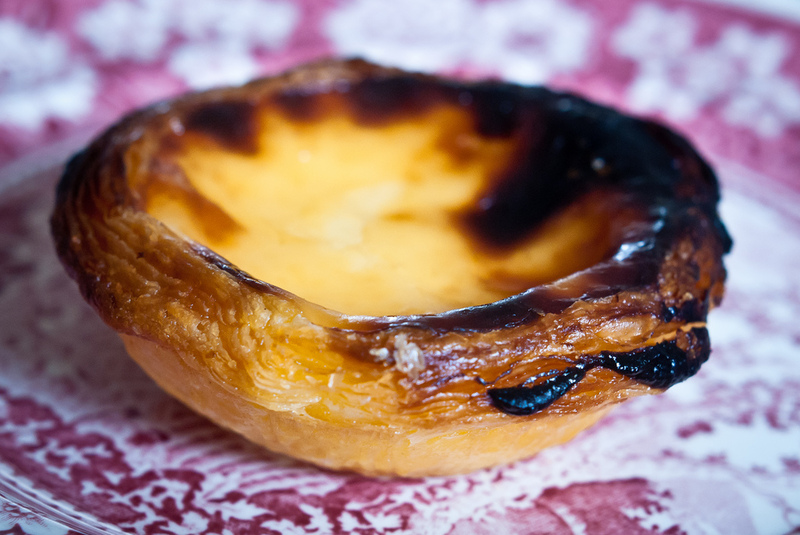 Don’t miss the rest of my top ten traditional dishes of Portugal! Bairro Alto/Chiado – Up and down Rua Alecrim are a series of high-end and trendy restaurants. Make sure you also explore the Rua Loreto, the side streets in Bairro Alto and up and down the side streets from Chiado plaza. PrÍncipe Real/São Bento – Continuing on Rua Alecrim up the hill, you’ll hit an area known for fusion vegetarian and ethnic cuisine restaurants. The area continues down from the Jardim Principe Real to Praça das Flores near São Bento where several other trendy restaurants/cafes are scattered in and around the the plaza. This is also a great bar area within the LGBT community. Campo de Ourique – This flat grid neighborhood up the hill from the Basilica da Estrela is perfect for experiencing traditional Portuguese cuisine. There are plenty of casual restaurants, tascas and pastelarias serving lunch and a handful of new-style and fine dining Portuguese restaurants that are great for dinner. This area is also excellent for shopping with its high-end clothing boutiques, classy gift stores and gourmet shops. When to Eat: Lunch is normally served between 12:30 and 3:00pm, but on weekdays, restaurants may close shop closer to 2:00pm. Dinner is served between 8:00 and 10:30pm, many until 11:00pm on the weekends (in the downtown areas). Like Barcelona, Lisboners also follow the same type of 6-meal schedule a day: 8am coffee with milk, bread with ham or cheese and orange juice; 10:30 coffee and a pastry, 13:00 lunch; 17:00 coffee and a pastry; 20:00 or 21:00 dinner. And if you arrive 15mins or even 30mins late, don’t worry, you won’t be last one! Nothing Is For Free – Appetizers typically brought out at the beginning of a meal are not free! Even if you didn’t ask for them, if you eat them, you pay. However, the cost is minimal unless you get some kind of seafood (shrimp, octopus salad etc). If you don’t feel like partaking, simply request the waiter take them back at the beginning of the meal. When in Doubt, use Silverware: Similar to Spain, most people use a fork and knife including: fries, cakes, pastries and fruit (like melon or apples etc). 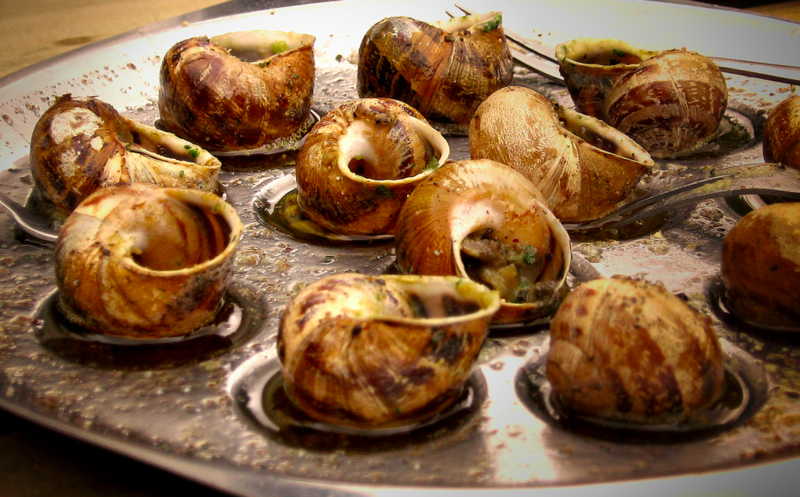 Few exceptions include: caracois -snails and most shellfish like clams, mussels, shrimp and crab. Dress Code: Dining out is often a casual affair, unless it’s a very fine-dining restaurant. Note that Lisbon women tend to dress fashionably. Festas Populares/Santo António – Parties are indeed popular all over Portugal, but Lisbon’s party for their patron saint is by far the biggest and craziest. With the entire downtown colorfully decorated, Festa do Santo António – Saint Anthony’s Party, packs the streets with people, parades and sardinhas -sardines grilling on outdoor barbecues along with other cheap cuts of pork like bifanas and entremeadas. The neighborhood of Alfama, right below the castle, is one of the best areas in Lisbon to enjoy the festas. Natal – the Christmas season, starting around the beginning of November and going through to first week of January. During this time you can find all of the pastry shops loaded with bolo rei (king cake)- the surprisingly delicious Portuguese fruit cake and other seasonal holiday sweets. Sonhos (dreams) are also tasty, consisting of fried dough balls mixed with either abóbora (pumpkin), cenoura (carrot) or simply coated with leite (milk). And keep an eye out for filhoses– thin, crispy fried dough and fatias douradas (golden slices), similar to French toast and coated generously in cinnamon and sugar. Broas (not to confuse with the Portuguese corn bread “broa”) are tiny baked sweets made of egg yolks, sugar and sweet potato typical around this time. And finally, if you’re craving something salty, there are plenty of roasted chestnut vendors set up throughout the streets of Lisbon from mid-October to early February. 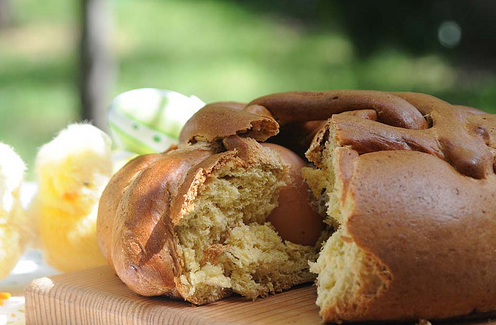 Páscoa – If you happen to catch the Easter season in Lisbon, the pastry shops sell their delicious Easter bread- Folar da Páscoa along with a variety of chocolate covered and candied almonds. Lisbon Restaurant Week – for the gourmands on a budget, Lisbon, as well as other major Portuguese cities in recent years has been embracing Restaurant Week, usually held in mid-January, late May and mid-September. Out Jazz Outdoor Summer Festival – Launched in 2006, these open-air free jazz concerts have become a hit among locals and tourists alike. The concerts have a mix of groovy, chill-out live jazz starting in the late afternoon then following with a DJ to liven things up into the evening. The concerts take place in Lisbon’s beautiful parks and plazas on Fridays and Sundays, rotating through the locales from May to September. Along with great music and an interesting mix of people in the crowd, expect to find plenty of ice-cold Portuguese beer on tap along with sangria and typical street munchies. Some of 2013’s concerts are also looking to be held in Lisbon’s downtown open markets, to help revitalize these areas. Castelo São Jorge + Alfama – Dating back as early as the 2nd century BC, Lisbon’s São Jorge Castle has been remodeled several times throughout the different civilizations that occupied the area. It stands on top of one of Lisbon’s seven hills, providing fantastic views (miradouros) of the city and river. Walking down from the castle is the picturesque neighborhood of Alfama, known for its twisty narrow streets and alleys. It is one of Lisbon’s oldest neighborhoods and here you can find ancient Roman ruins, Medieval churches and traditional Fado bars. To get up to this area take a ride on the #28 trolley from the downtown. Baixa de Lisboa: Downtown – This is essentially Lisbon’s center, starting from Restauradores to Praça do Rossio, Praça da Figueira (where A Ginginha is located between these two plazas), following to Baixa Chiado and ending at Terreiro do Paço/Praça do Comércio at the riverfront. Though mostly touristy, with overpriced restaurants and cheap souvenir shops, you can find a few cute clothing boutiques and Pastelaria Nacional, one of the oldest pastry shops in Lisbon. Overall it’s a beautiful area for strolling around and taking photos of Lisbon’s historical architecture. Bairro Alto – One of the hip neighborhoods in Lisbon, just up from the Chiado area. During the day, Bairro Alto is known for the combination of a fashionable commercial area with the feeling of the typical old time Lisbon. At night, there are numerous restaurants and bars open, with the streets and alleys crowding up with people hopping from place to place (as most bars in this area are known for being small), grabbing a drink, socializing with friends and in general having fun- in what looks like a giant block party on the busiest of nights. Luckily though most of the shops and boutiques that are open during the day are also open at night, until at least midnight. Any Fado Bar – Fado is the traditional music Portugal. There are different types of fado songs, but the Fado de Lisboa is by far the most popular, having a more upbeat feel compared to the melancholy fado of Coimbra. You can either have a meal or a drink at a Fado bar, if you want to sit and enjoy the passionate live music. Don’t hesitate to chime in if you know the tune! Any Wine Bar – From the Algarve to the Minho, including the islands of Madeira and the Azores, Portugal has a wide array of regional wines to choose from and Lisbon’s wine bars will tempt you to try all varieties. Don’t forget to ask for some of the great bread, cheese and chouriço to pair with your wine exploration. Belém Area – Belém is one of the areas that cannot be missed while visiting Lisbon. There are ton of historical sights and monuments here – the Tower of Belém, the Monument of the Explorers, Jerónimos Monastery, the Carriage Museum and the Cultural Center. And to top it all off this is the home of Pasteis de Belém – the best custard tarts in Portugal. Our suggestions are known for providing great customer service, professionalism, ambiance, and for some, an in-house restaurant to satisfy your gourmet needs. Check one out and let us know what you think! Bairro Alto Hotel – Perfectly located in Largo de Camões in Bairro Alto, this 5-star luxury modern boutique hotel has a very friendly and attentive staff, a spa and fitness center, a delicious fine-dining Portuguese fuision restaurant, Flores and a top floor café lounge with a panoramic view of the river. Not to be missed! Lisboa Carmo Hotel – Located on the corner facing the pretty Convento do Carmo plaza up the hill from Chiado, this contemporary 4-star boutique hotel just opened in 2012 and has already gotten rave reviews. Not only is it in a beautiful central location, its modern Portuguese petiscos restaurant Maria do Carmo has outdoor seating in the Convento do Carmo plaza to thoroughly enjoy the historical beauty and delicious food. Bairro Alto Hotel – This 5-star boutique hotel is located in central Lisbon, near the heart of historic downtown, between two of the most emblematic city districts, the bohemian Bairro Alto and the chic, cultural and trendy Chiado. Lisbon Carmo Hotel – On the edge of one of Lisbon’s prettiest plazas, this 45-room hotel has classically designed rooms, the best of which have sweeping Lisbon views. It earns high marks for its use of Portuguese products both in the rooms (bed linens, towels, bath products) and in the pleasant ground-floor restaurant. Altis Avenida – Perfectly located on the Praҁa dos Restauradores, this hotel faces the Avenida da Liberdade on one side and the neo-manueline, horseshoe-arched Rossio station on the other. It was built in Lisbon’s 1940s heyday and became a hotel in 2011, offering 70 elegantly designed rooms and a rooftop restaurant. Castilho House – Just up the hill from Marques de Pombal metro on Rua Castilho is this 8 – room suite bed and breakfast, tastefully designed with warm earth tones and stylish art pieces. Enjoy the peacefulness of the tiny gem while still being close enough to the chaos of the center! Corinthia Hotel Lisbon – This 5-star luxury hotel is located just up the street from the Sete Rios Blue line Metro stop that will take you on an easy 10-min ride to the downtown. The hotel features two restaurants, a spa and fitness center, swimming pools and breakfast on the outdoor terrace overlooking their gardens. In the summer the terrace lounge hosts live jazz in the evenings. Upper floor rooms also boast stunning views of Lisbon’s ancient Aqueduct and Monsanto Natural Reserve. For those who prefer something more independent, why not stay at a country house (aldeias)? Planning on traveling in Portugal a bit longer? Why not check out our various tours throughout Lisbon, or if you’re heading north, read our gourmet’s guide to Porto! (Hint: we’ve also penned foodie’s guides to the best Spanish cities, including Madrid and Barcelona). Get in touch with Catavino and discover Lisbon with us!